The current technology she was using was very outdated and had several technical glitches. There was hesitation from her clients to trust a remote product because they experienced difficulties in the past. Complicating the process was the fact that no one in Canada had successfully used a remote product for CART/captioning; therefore, her clients were insisting she come on-site to provide her services. To effectively change the minds of her clients, Sandra needed a remote captioning solution that would allow her to capture the spoken word and deliver it as if she were sitting in the same room with them. Plus, it had to integrate with her current CAT software. To meet this challenge, Sandra chose StreamText as her remote captioning partner. Having heard top captioners in the field were already successfully using StreamText for its robust features, reliable industry reputation, and ease of use, she knew they could provide a solution for her, as well. 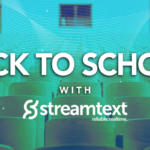 Sandra had the opportunity to speak with company CEO Nick Wilkie and learn how StreamText is more than just a realtime text communication solution. They truly listen to their customers, and they partner with them to deliver high-quality solutions at very competitive prices. Having partnered with StreamText for the past several years, Sandra has had the opportunity to successfully provide reliable solutions to her clients across Canada. Sandra recalls the time she was hired to provide on-site captioning at the annual Canadian Hard of Hearing Association meeting. Unfortunately, many members of the association could not attend the meeting in person. However, Sandra was able to utilize StreamText to stream the proceedings outside of the meeting hall to members across Canada to view on their own devices where they could adjust the font, colors, size, and appearance to meet their personal needs. Members that were participating remotely were able to chat with members at the convention site by using the chat feature in StreamText, making them feel like they were onsite asking a colleague a question in person. StreamText also played an integral role when an agricultural student was on a field trip in the middle of a farm and needed to “hear” what was being said. Sandra used the student’s smartphone to listen to the instructor, while the student used the same smartphone to read the streaming text via StreamText. The reliability of StreamText and the customer support Sandra receives is second to none.